Our 2015 initiatives were once again Garlic Mustard and Spotted Knapweed at Tawas Point State Park. Our 2015 Garlic Mustard focus was once again under the umbrella of the Tawas Point Birding Festival with the assistance of Michigan Audubon. 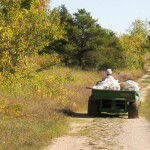 There were two scheduled pulls on Friday and Saturday, with a short cleanup pull on Sunday. Our total volunteer hours were 18 hours. Our total General Mustard poundage pulled was 191 lbs. That is a lot! and front-line prevention from a potential 10,000,000 seeds getting back into the seed bank. The 2015 Spotted Knapweed pulls at the park were scheduled each Tuesday morning for 2 hours and were scheduled for 8 weeks in July and August. In 2014, the AuSable Valley Audubon brought resources to bear on two different invasive species at the Tawas Point State Park – Garlic Mustard and Spotted Knapweed. Total poundage removed this season was 975 lbs and total volunteer hours worked is 90.5. We accomplished much, but the overall consensus of pulling volunteers was that with more people – so much more could have been accomplished. 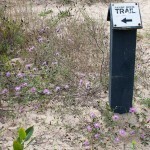 Consider assisting with future pulls and helping to make your state parks and nature areas a better place. Garlic mustard was growing abundantly behind the Tawas Point State Park office. 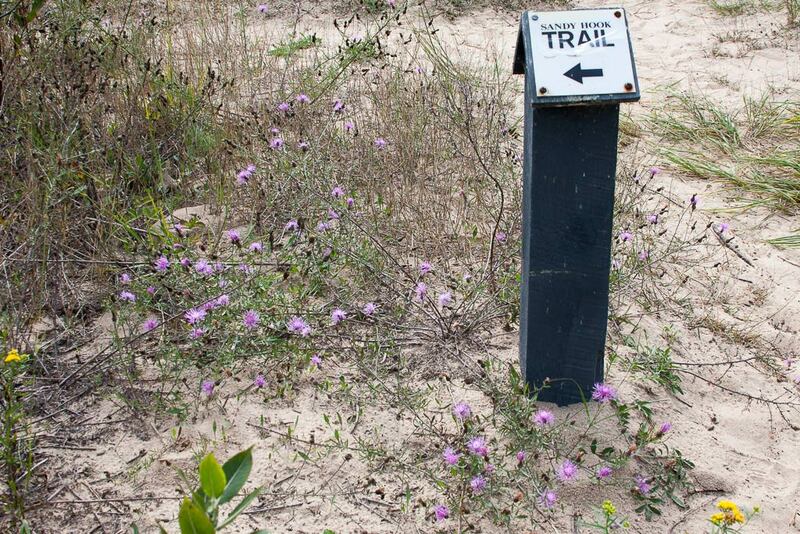 Fortunately that is the only place in the state park that it has been found. Combining the efforts of Michigan Audubon and AuSable Valley Audubon to recruit volunteer pullers, we offered two pulling events during the mid-May Tawas Point Birding Festival. One event on Friday and a second event on Saturday were both successfully attended. Not only did we clear the area but we removed 235 lbs. of Garlic Mustard and prevented millions of seeds from re-seeding the ground. Because seeds are viable in the ground for a few years, most likely we’ll plan more pulling activity for next May. We had started the project in mid-June when Spotted Knapweed was fairly easily identified. We continued to pull the invasive, noxious plants through the summer growing and flowering season. Two days later (on Thursday) the group did a 2.5 hour pull to catch as much as we could before having to end the season. We were watching for open seed heads, which was a signal that our season end was near. Because we were anticipating that with Mother Nature’s life cycle, we were not surprised to find it. With that finding, we ended our pulling season on Thursday. This season we had the help of a total of 10 AVA members and friends. Six were regular pullers and the others plugged-in by helping for an hour or two. 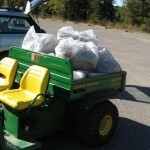 Over the summer we pulled and stuffed 157 black 30 gallon garbage bags. By removing the Spotted Knapweed weeds, we changed the face of the state park landscape, as well as preventing millions of seeds from getting into the ground. At the same time we talked to park guests about invasive Spotted Knapweed. To us that was satisfaction enough, but at our late August picnic and outing, State park director, Chuck Allen, and his wife Peggy were present. 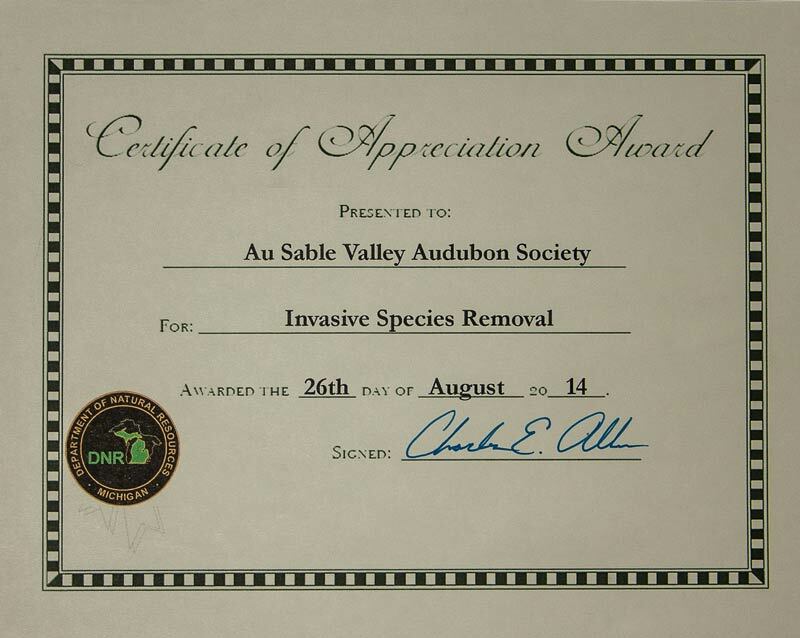 All of us were surprised when he awarded the AuSable Valley Audubon with a DNR Certificate of Appreciation Award for Invasive Species Removal. 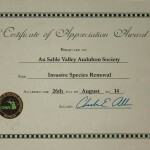 Donette Spiekerman accepted the award on behalf of the AVA and those members who have worked to remove invasive species plants from the state park. This additional recognition from the DNR was an added perk. 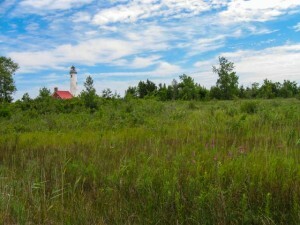 In 2013, The AuSable Valley Audubon is organizing a volunteer group to remove invasive, noxious species of plants from Tawas Point State Park. This project primarily targets Purple Loosestrife and Spotted Knapweed. 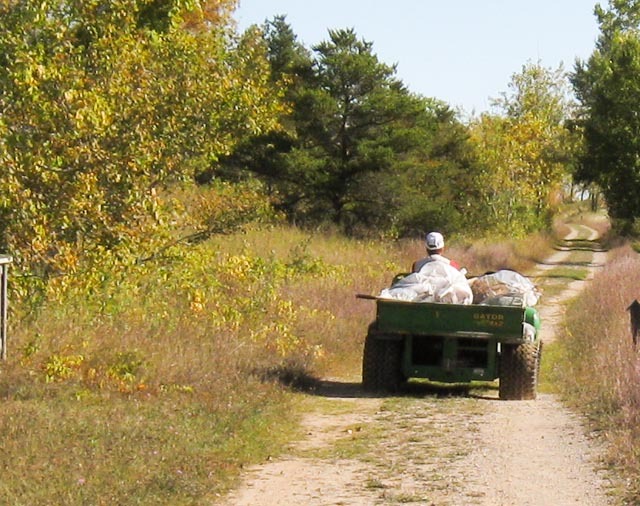 The project is organized, planned and scheduled in coordination with Huron Pines and the Michigan Department of Natural Resources, Parks and Recreation Division. We have been meeting on alternating Wednesday mornings at 9:00 a.m. for 2 hours of work. Our work so far has predominately cleared the bay side of Purple Loosestrife. During our last pull we rounded the tip of ‘the point’ and are beginning to concentrate our efforts on the beach side. Where there are dense concentrations of Purple Loosestrife we are documenting each of those areas with GPS coordinates and placing those site coordinates onto an arial map. Documenting those areas should provide the Tawas Point State Park administrators with information they can use to clear the areas. Our Spotted Knapweed pulling is centered on high value areas and our last pull targeted the Spotted Knapweed growing along Sandy Hook Trail. 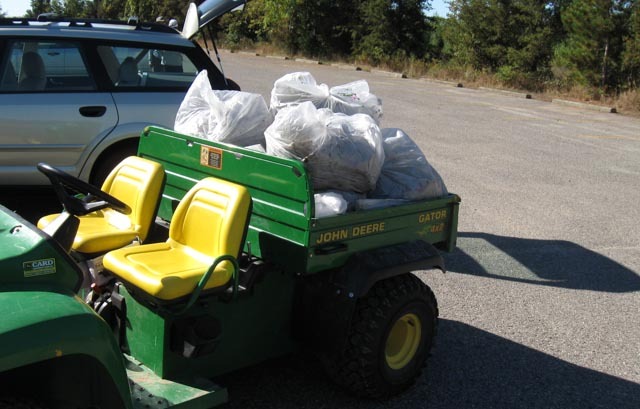 During five pulls we have logged 97 volunteer hours and disposed of 129 large bags of noxious weeds. We hope to continue this project while the weather is mild. In the spring we expect to target some areas of Garlic Mustard.